You can’t spend, tax, regulate and borrow your way to prosperity. Or — perhaps you can. But be careful — he really was a tad smarter than young Paul. ¹quoted in G. Findlay Shirras and J. H. Craig, “Sir Isaac Newton and the Currency” The Economic Journal, Vol. 55, No. 218/219 (Jun.-Sep., 1945) pp. 230-231. *I’d be failing my Galtian duty as a profit maximizer if I didn’t mention that I discuss Newton’s role in coming up with new conceptions of money in my book Newton and the Counterfeiter, available at Amazon and wherever books are sold (also as an audiobook, where my sales are, alas languishing). 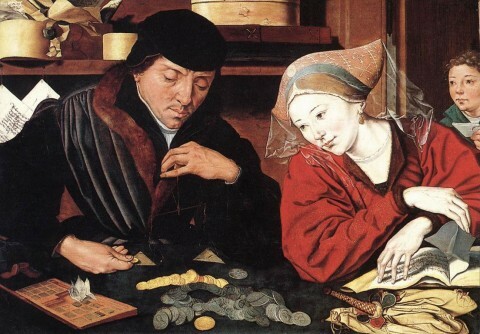 Images: Marinus van Reymerswale, The Money Changer and his Wife, 1541. 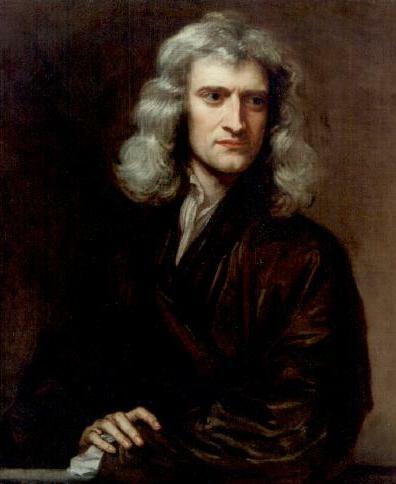 Sir Godfrey Kneller, Portrait of Isaac Newton, 1689. Wednesday Isaac Newton Blogging: The (Very) Deep Roots of the Banking Crisis. Coming up next June, I’ll be publishing my book, Newton and the Counterfeiter, in which I tell the story of Newton’s mostly unknown career as a criminal investigator and death penalty prosecutor. 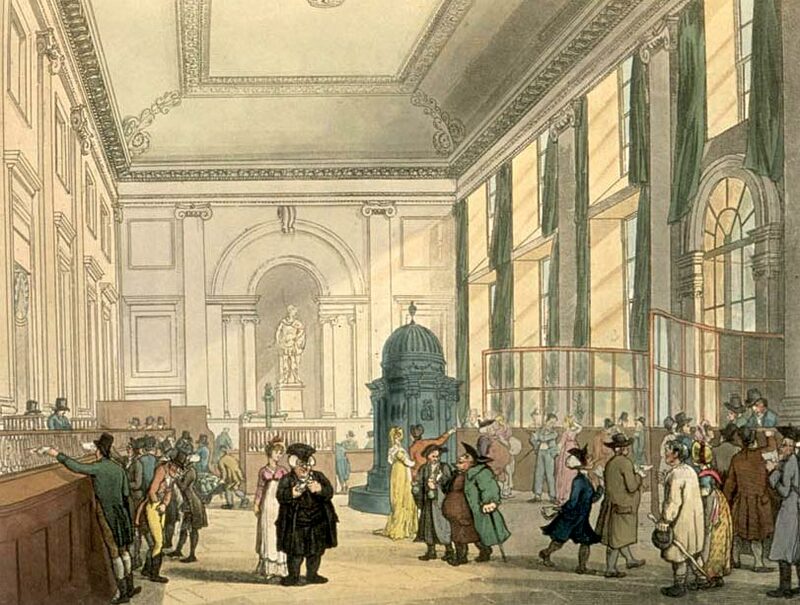 It is as well a story that touches on the birth of the modern financial system — it covers the period when things like the Bank of England, fractional reserve banking, a variety of paper instruments, debt-for equity swaps (a little later, actually) and other such esoterica were all being tried out. Of great importance was the development of a bunch of different approaches to financing government expenditure. All kinds of things got a work out. The book deals with some of them, including a marvelous chimera of an instrument that was at once a lottery ticket, paper money, and a bond. Weird — but creditors of the Royal Navy, among others, were compelled to accept the notes at par. Unsurprisingly, some writers on what was yet to be called the discipline of political economy had grave doubts about the transformation of money into paper, and government resources from receipts into debt. They raised questions. And on at least one occasion, Newton answered them. In 1700, Newton, then Master of the Mint, got into a dispute with John Pollexfen, a member of parliament and a founding member of the Board of Trade (with Newton’s friend and admirer, the philosopher and theorist of money, John Locke). Pollexfen was a hard money guy — paper might have some use in the financial system, but everyone knew real money took the form of silver and gold coins. He argued that use of paper instruments depended on the money being held to support it. Not for him was this new fangled notion of fractional reserve banking: an institution issuing a note had to have the denominated amount in coin to back up the piece of paper that claimed to be money. That is: paper was a convenient method of signifying the existence of an amount of real money; it was not money in and of itself. Interesting ideas, no? Increase the money supply to lower the price of money, the interest rate, and thus enhance trade and employment. What a notion! Newton did allow that credit was like doctor’s physic. To a certain dose it was helpful; to excess it could be deadly… a sentiment which also has strangely contemporary echo. None of this to say that Newton was anything like a pioneer of economic thought; he was not. Most of his views represented variations on contemporary elite opinion — which was struggling to come to grips with a transformation in finance that accompanied the global expansion of English and European trade and economic life. …and not even Isaac Newton himself avoided the infection, as will be discussed in another post, soon. (See G. Findlay Shirras and J.H. Craig’s article “Sir Isaac Newton and the Currency” in The Economic Journal, Vol. 55, No. 218/219 Jun – Sep. 1945 for a fuller account of Newton’s involvement in the currency/credit issues of his day). Image: Augustus Pugin and Thomas Rowlandson, “The Great Hall of the Bank of England,” in Ackermann’s Microcosm of London (1808-11). (Anachronistic, I know — but what a nice image.) Source: Wikimedia Commons. Friday (Isaac) Newton blogging (Monday edition): Isaac solves the subprime mess. We are in a mess. How bad is it? I don’t know — but when the Fed et al. race to make sure that the most significant housing lenders in this country are less fiscally sound than they were last week, all to pump some extra dollars into the mortgage market, you know it ain’t good. Tim was joking, I think, but in fact Newton would be a more appropriate choice than just about any other physicist I could name. England in the late seventeenth century experienced a financial revolution as well as its more famous scientific one. Newton took part in both. For example — he was among the great and the good whose advice was sought on what to do about the disappearance of England’s silver coinage in 1695 — along with such luminaries as John Locke, Charles Davenant and Christopher Wren. Then, beginning the next year, first as Warden and then Master of the Royal Mint, he became a significant, if not the dominant player in the transformation of England’s money system from a silver to a de-facto gold denominated pound. More to Tim’s point, Isaac Newton took up his role in England’s nascent financial bureaucracy at a time of wild, uncontrolled, truly exuberant financial engineering. This was a time when the English government’s attempts to fund a wildly expensive overseas military adventure (the Nine Years War) stretched to include licensing the issue of tickets that were at once (a) high-interest bonds (what might later be known as junk), backed by a stream of government tax revenue on malt, the key raw ingredient in making beer;* (b) entries in a lottery, offering chances to win up to a 1,000 pounds against a ten pound ticket; and (c) paper money. As another excessively premature plug — I cover all this in my book on Newton as a currency cop, coming out early next year. But for now the point is that Newton was not only present while all this happened. He was in fact a fairly senior civil servant working for a government struggling to figure out how to fund and foster a transforming economy. He was a pretty smart guy too, I hear, and he thought in some detail about questions of credit, government control, and probity in financial dealings. He came to a lot of quite sensible conclusions about the new paper instruments, and the proper role of debt and credit: “If interest be not yet low enough for the advantage of trade and designs of setting the poor on work..the only proper way to lower it is more paper credit till by trading and business we can get more money.” Keynes forshadowed, anyone? Interest is certainly heading low enough for the advantages of American export trade. (evanescing dollar, anyone? I’m only complaining as one who just had to wire a fee for a researcher in London). We still have a way to go to set the poor on work, but at least Newton had that as one of his priorities, which is more than I can say for some, on the evidence. And certainly, the interesting times (in the Chinese sense) we are living in confirms the truth of the observation of the relationship of opinion and value. But even though Newton could see what many others could not about the essentially abstract nature of money, he was not entirely immune to the confusion — or perhaps to baseline human desires — triggered by half-comprehended new notions of finance. His first investment in the South Sea Company paid off, when he sold on the rise. But even though there could have been no other man in England better placed to grasp the mathematical implications of the unfolding scheme — he still bought back into the madness of the bubble year, 1720. He lost, by his heirs’ estimate, some 20,000 pounds — a prodigious sum, a fortune. *** It’s hard to gauge what that means across such gaps of time, but using the Parliamentary research service’s estimate of inflation across that time, a rough guesstimate leads to the conclusion that the smartest man in Europe blew the modern equivalent of better than three million pounds on a “greater fool” dynamic of what had become, in the end, a fairly straight forward pump-and-dump stock fraud. Newton had succumbed to greed, or perhaps the simple impetus of the common mania — but which ever it was, it still overcame both his capacity to think quantitatively (Newton!) and any prudential impulse. After all, he was rich already. He didn’t need to risk much to gain much: when he died, seven years after the bubble year, he still left a fortune of 30,000 pounds, not counting his land in Lincolnshire. The moral of the story: This is why you need to regulate financial markets. No one, not even the cleverest, is immune to all the familiar temptations of money in flux. No wise man remains wise always; one of the most reliable inducers of folly is the possibility of gains that seem to repeal financial laws of gravity. Rules that are no respecters of persons are there to save even the Isaac Newtons among us from themselves. *More crucial than you might think given that weak beer was the staple fluid in a society where the water supply looked like this. **Both quotes taken from Newton’s Mint papers, and published in G. Findlay Shirras and John Craig, “Sir Isaac Newton and the Currency,” in Economic History. Subscription required. ***It’s not quite clear from the record exactly what Newton lost in the bubble. The suggestion is that he lost an investment of 20,000 pounds, but this seems unlikely, given what is known about Newton’s income throughout his career. More likely, and the more popular interpretation among Newton scholars, is that Newton converted into South Sea stock debt instruments with a total, long term future value at that rather grand number. In other words, he didn’t lose tens of thousands in cold cash; rather, he gave up income that could have added up to very satisfying amounts over time. Still a lot of money, but not the stunning out-of-pocket disaster the raw number implies. Images: Quentin Massys, “Der Goldwäger und seine Frau,” 1591. The reproduction is part of a collection of reproductions compiled by The Yorck Project. The compilation copyright is held by Zenodot Verlagsgesellschaft mbH and licensed under the GNU Free Documentation License. Source: Wikimedia Commons. 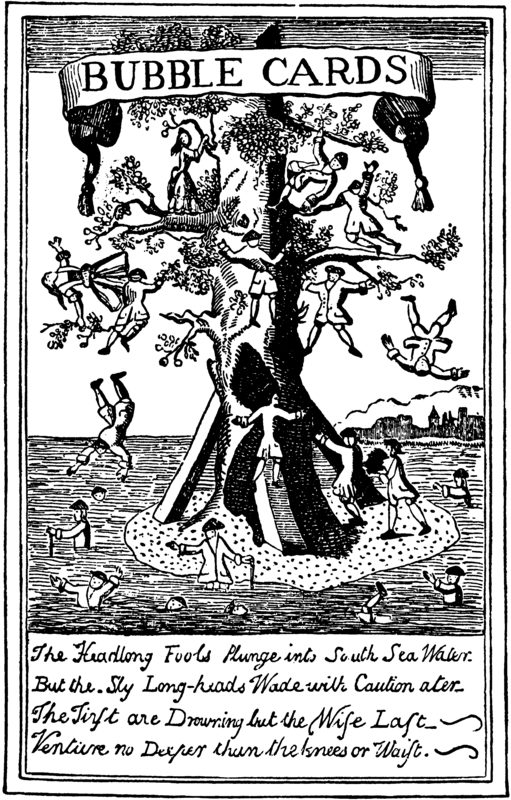 South Sea Bubble Card, 1720. Source: Wikimedia Commons. Categories: Economic follies, History, History of Science, Isaac Newton, Newtoniana, quis custodiet ipsos custodes, scientific revolution, Uncategorized, Who thought that was a good idea?